In the wild, budgerigars, also called budgies and parakeets, spend their entire lives in flocks of up to several hundred specimens. In captivity, their flock is you. Successful bonding with budgies ultimately comes down to one thing: social interaction. Your budgie needs you to treat him like a family member. If you spend time with him, bonding will naturally follow. In the wild, a lone budgie is a dead budgie, plain and simple. These birds rely on their flocks for everything from locating food sources to evading predators. Just as a flock is necessary for their physical health in the wild, a flock facsimile is necessary for their emotional health in captivity. The caged bird's flock can be made up of other budgies, human companions or both, but it must supply many hours of interaction every single day. Talking to your budgie for 20 minutes after work or school while you change his water simply isn't going to cut it. When you talk about bonding and socializing with budgies, you're talking about hours every day for the rest of his life. If you can't commit the time, either don't get a budgie or get more than one in a very large cage with lots of appropriate toys. 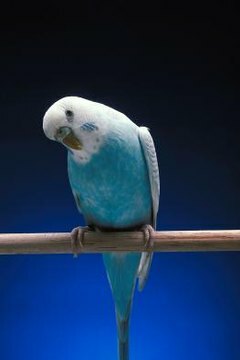 Budgies communicate with one another through sound and body language. They love to make noise, and you should join them in this activity. Talk to your budgie whenever you're together. Sing to him. Keep his cage in a relatively active room, and greet him first thing in the morning. Some -- not all -- budgies respond well to a radio or television if they have to be left alone. Hand-taming is the most essential element of bonding with your budgie. It makes inclusion of your feathered friend in your daily activities possible. A hand-tame bird is comfortable being touched, being fed directly by hand, stepping up onto a hand and riding on his person outside of his cage. To hand-tame, introduce your hand gradually, in a nonthreatening way. Begin by placing your hand near your caged budgie, with the bars between you, while speaking softly and calmly. After he's comfortable with this, you'll place your hand near him inside the cage, then offer treats, then use treats to encourage him to step onto your finger. You'll eventually have a budgie who trusts you enough to ride your hand out of his cage. This takes several weeks of committed, daily training. You should be devoting at least 15 minutes twice a day to hand-taming. Make feeding a social activity you share with your budgie. Offer some of his food from your hand or, better yet, eat your meals together and share bits of your bird-safe foods with him. Once your budgie is hand-tame, put him on your shoulder and take him with you as you go about your daily routine. Every minute you spend interacting together will pay off in a closer bond with your pet. Budgies occasionally groom one another. Some budgies enjoy this attention from their human companions, too. Your budgie may enjoy head-scratching or gentle petting as he sits on your finger. Some budgies enjoy lukewarm mist baths from a spray bottle. If your budgie likes baths, he'll spread his wings and actively "bathe" in; he may try to drink the mist. As you learn to include your budgie in your day-to-day activities, beware of common household hazards fatal to birds. Keep your friend inside his cage if you are cooking or working with any other type of boiling water or flame. Beware of cleaning solutions, especially aerosols and sprays. Avoid other strong scents and airborne chemicals, including perfumes, hairsprays and scented candles. Keep doors and windows closed while your budgie's out, and don't let him mingle with other pets, especially cats.